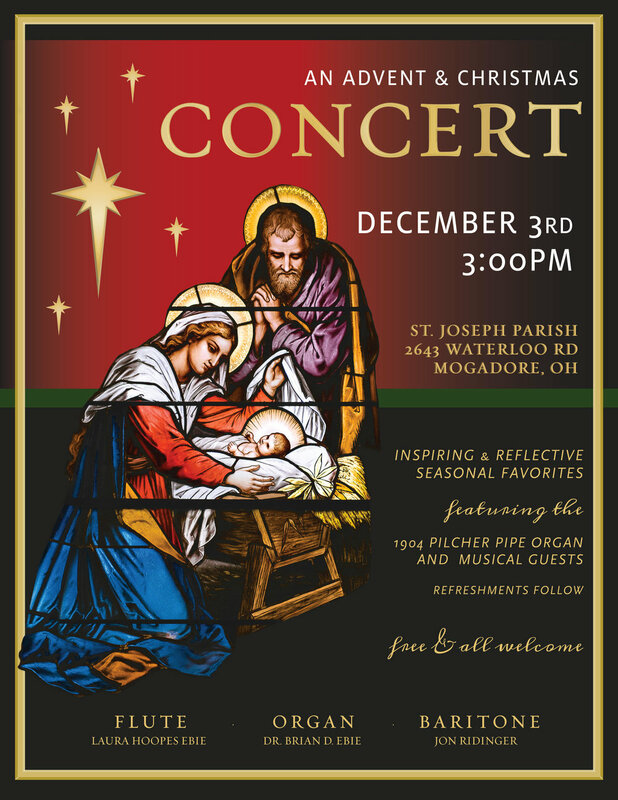 I want to invite you to a holiday concert in the historic St. Joseph Parish church on Sunday, December 3, 2017 at 3:00 P.M. I'll be playing the 113 year old Henry Pilcher tracker pipe organ on solo works and with Laura and Jon -- featuring favorite carols of the season with flute and voice. The lively acoustics and bold sound of the 1904 pipe organ combine to make a wonderful, uplifting sound. Laura Ebie’s flute playing in St. Joseph’s beautiful sanctuary has been described as “sweet sounds floating down from heaven.” Adding to that, talented baritone Jon Ridinger will lend his beautiful singing voice to the perennial favorites “Oh Holy Night” and “Of the Father's Love Begotten” and help lead the audience in carol singing. Refreshments and fellowship following the program. Come and welcome in the Holiday Season!